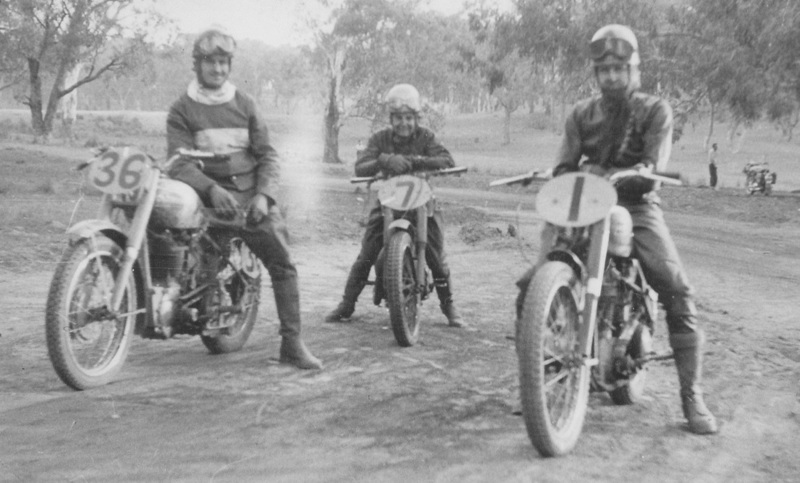 The Orange Short Circuit Speedway operated during the 1950's, The venue only lived a short life, The track was run by the Orange Sports Motorcycle Club who found themselves offside with the local authorities over removing tree's on the site and were asked to leave. On the closure of the speedway the Wentworth Golf Club moved in and it has been said, that they removed the same trees anyhow. After the closure of the Orange Short Circuit Speedway the club built Stonecliff Speedway at Claregate on property owned by Emmett Fanning, Fanning offered a paddock on his property free of rent. 1954 - Johnnie Sheilds on the 36 machine with 2 unknown riders. Photo: Peter Sheilds. 1954 - Start line action at the Orange Short Circuit. Photo: Peter Sheilds.